Every Momma Quail needs a baby to match. These fat little babies are adorable and detailed. With wide opening eyes, a baby beak and little top hat you can't but fall in love. Tiny side wings and a chest of feathers complete the look. 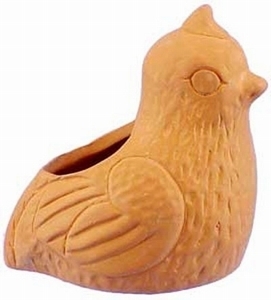 Fill with small flowers, green plants or even a tea light candle. Sweet! Baby Quail $15.00 4.00" 3.00"